Antiques, Collectibles, Books & Gifts - The former Burwell Butter Factory has moved to Sargent! The Abbott Emporium features turn-of-the-century oak store fixtures in this historic Sargent, Nebraska landmark. One step in and you are transported back to 1908! The tin ceiling has been restored & accented by authentic commercial holophane light fixtures. The massive oak cabinetry offers a clean organized format for each & every collectible from past times to modern day. The Abbott Emporium is dedicated to acquiring a wide selection of treasures to satisfy the needs of our diverse clientele. Come see why 97% of our customers return & consider this store a Sandhills area must stop shop. Hours: Open by Appointment only. It only takes 5 minutes to drive over & open. Some of the brands we carry are Baker, Baumritter, Century, Davis Cabinet Co, Ethan Allen, Habersham, Harden, Henredon, Heywood Wakefield, L. Hitchcock, Jasper Cabinet, Kittenger, Pennsylvania House & Tell City Chair Company. There is no affiliation between any of the above brand names and EarthJunk. We do not represent these companies. We sell used furniture made by them. If you are looking for new furniture, please shop with the fine companies. Hours: We are open by appointment only. Please call or email. We will be glad to open early or late to accommodate your traveling plans. Florist, cards, & great novelties! Professional Antique Dealers open Every Saturday May 1 to Nov. 1 Part time dealers open by Chance or Call for an Appointment. NEBRASKAntiques.com has separate pages for each store and their contact information. Some dealers have multiple stores. 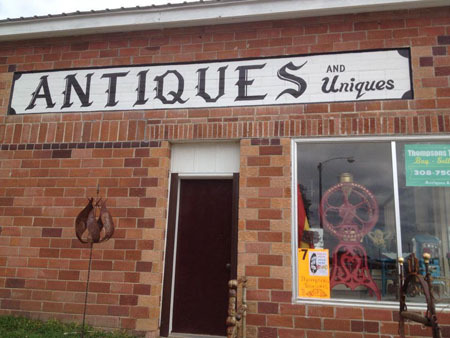 Nebraska Antiques has 10+ antique stores full in Sargent, Nebraska. Sargent is the Antique Capital of Nebraska. Sargent is home to the Junkathon and 183Flea Market. Sargent is located at the center of the Junk Jaunt and headquarters for all Early Birds. Sargent Stores are: Abbott Antique Emporium, April Kitt's The Nook, Earthjunk's Ethan Allen & Tell City Furniture, Forget Me Not Floral & Gifts, Gone Rockers Used Furniture, Little Red Hen Rehaberdashery, Smores, Thompsons Treasures & Wagons, The Livery Stable, and Trucklode Collectibles and Trucklode Furniture. Mdear’s Dime Store is opening soon. We are dedicated to providing you with superior quality American Made Investment Grade products that fulfill all your furnishing and decorating needs. Our shop owners take pride in their old fashioned customer service. We guarantee you will have a great time visiting the Antique and Furniture Stores. Call for hours of operation. Sargent is a quick drive from Kearney or Grand Island, Nebraska. Your local grocery store... where you make the difference! Also available cards for every occasion and a deli to go! USDA Choice Meats, Custom Processing & Butchering, smoking & curing, homemade sausage (custom & retail), & lockers for rent! April's cottage is stuffed full. Fabrics, prints and pottery are a few examples of the home accessories April offers.When a cottage is as cozy as April's is, small wonder the locals always want out of town family & friends to visit it. Buying and selling antiques and 'uniques'; restoring antiques from pumps and horsedrawn equipment to primitive cupboards, and horse drawn wagons. Also, 'wire yard art' & treasures from architectural salvage, such as benches and hall trees.